Moritz is a media technology engineer who helps startups to build amazing products beyond the backlog and author for hackaday.com. After years of bringing startups, from IoT over wearable technology to 3D printing, over the finishing line, he has somewhat become an all-in-one mechanical/computer/electronics engineer plus jack of all trades. Moritz loves code, electronics, and heavy machinery and is an active member of the Attraktor Makerspace Hamburg. I've tested this with a few prints so far and it is amazing. Takes my bed a little over a minute now to heat up to 100 deg C! Before I had a 12V heat bed that took 20+ minutes to heat up to 100 deg C and could barely hold the temperature. If you have a 12V heat bed currently throw it out and buy this! * Defaulted to 5 stars for communication but there was no need to contact the maker. So, I ordered this as sort of a test of Tindie (my first purchase) as well as supporting a Hackaday.io project. Now after running with the product installed on my printer for over a week, I've become forced to write a glowing review. I normally don't take time from my busy life to review things unless they're horrendous or amazing. This is definitely one of the latter. 1. Documentation - the writeup on Hackaday.io is detailed and documented well with pictures. 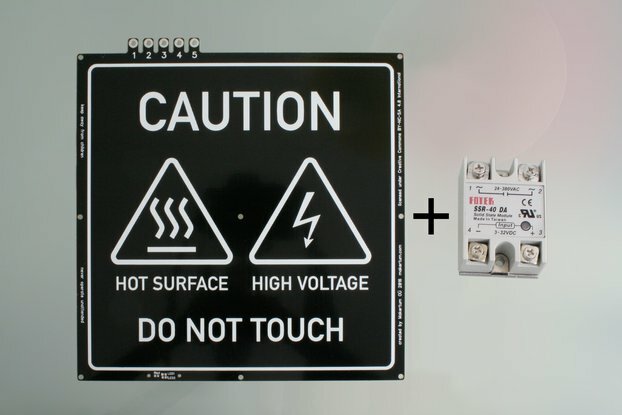 The only thing I would change about it is to add a diagram showing how to connect to your 3d printer's controller - but really it isn't any different than your old heated bed. Also, with the SSR chosen, you can do PID just like the old DC heated bed you probably used. 2. Safety - the little things like including a cover for over the SMD LEDs and the thermal fuse, copious heat shrink, in-line fuse, etc. These all add up to a well thought-out product with safety not taking a back seat to convenience or cost. 3. Cost - what you get for what you pay is well worth it. The SSR itself is not cheap and is a good brand. Nothing was sacrificed in the name of making money - rather I'm actually very surprised that this product can sell for what it is and the maker actually feels it is worth his time to produce! 4. Community - on top of it all, I would have bought it to support Hackaday and Tindie and the maker - if for no other reason than to help support another maker and not to support some large corp.